Today marks the second anniversary of the death of Iain Robinson a long time member of the congregation and long time fellow traveler. (correction – Iain died on the 14th). We traveled around Japan and in China in 2005 and before and after that we worked on various projects connected to the religious order I am part of. To remember and honour him I’m republishing this poem first published 18th July 2011. The original post is titled Simple Acts of Kindness. Remembering you Iain, dear good friend. Who doesn’t? Who hasn’t at some time worried and been anxious? There is usually a ‘story’ isn’t there, one that can be returned to and ‘seen’. Somebody said to me the other day that one way of thinking about or viewing the difficulties of worry and anxiety is to see them as a negative use of our powers of Visulization! This is not to suggest one then replaces the negative with the positive more to say that what we return to tends to be what we return to, over and over and over again. Pictures are compelling. Returning to just sitting, allowing thoughts to arise and pass without judging them, or oneself for having them, is worth a go. Regularly. Simply sitting and opening oneself to oneself, which doesn’t look like much, does weaken habits. That happens without needing to consciously unravel the tangles of our minds. As one of our scriptures states The obstacles dissolve…. Everyone who is seriously involved in the pursuit of science becomes convinced that some spirit is manifest in the laws of the universe, one that is vastly superior to that of man. The above quote is from a letter by Albert Einstein to a young girl who asked if scientists pray, and what for! From a recent Brain Pickings article. In this way the pursuit of science leads to a religious feeling of a special sort, which is surely quite different from the religiosity of someone more naive. Interesting answer I felt. I’d like to have read that earlier in my life. 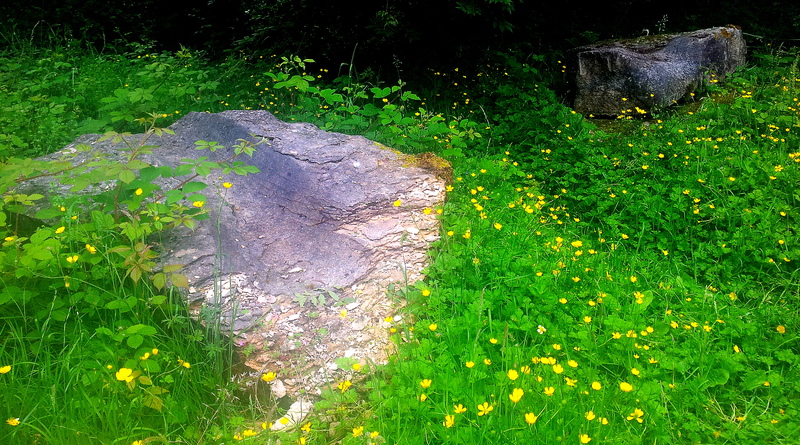 ‘Passage’ Eden Benchmarks, Stenkrith Park, Kirkby Stephen. Crumbling. It’s a long time since I made myself a new day robe. Years possibly. Time passes and one doesn’t necessarily see the frayed cuffs and faded fabric. Imperceptibly, day by day material things age. A rip does get ones attention signally something needs to be done however for the most part the everyday wear and tear goes unnoticed. If the garment does the job that’s good enough and with a weekly wash appropriate smartness is maintained. Yesterday was almost entirely devoted to making myself a new robe. That involves measuring the old one and then cutting out new fabric ready for sewing. So I’ve been taking a closer look from the outside at what I’ve been wearing every day. The fabric is not at its best, several seams need a few mending stitches and the sleeve cuffs are worn through and overdue for repair. I’ll be giving it some TLC after the new one is finished and then it will become my second best. And I love that robe! Anything used, worn and handled daily builds a loyalty and a caring and a cherishing which forges a bond. One could say this is just attachment and in part that is true. Recognizing this dynamic between oneself and items of personal use though doesn’t mean the next step is to get rid of, or lower ones regard and gratitude. Not at all. In fact items of personal use that once belonged to revered masters and teachers are highly valued as an object of remembrance. I’ve several things which my late teacher used. 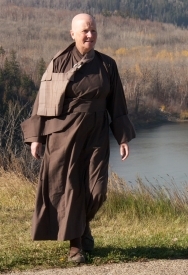 In fact I have a brown small kesa made out of fabric from one of her day robes! What’s stuck in my mind is a conversation from yesterday. I’d been chatting generally to an acquaintance and mentioned what I’d been doing all morning. Oh, are you going to put in part of the old robe? she asked. Why would I do that? I replied. For continuity, was her response. Now pondering on this business of continuity generally I’m left thinking the marks we make in the world, which gradually crumble and eventually decay, are the visible marks of the life of the Buddha having been lived. I love my old robe because it has given me shelter to live this life, which has no beginning and no end! The day in and day out living the life the Buddha taught is that which lives on. Unbroken continuity? Spent a lot of time this morning thinking about the six women who climbed London’s Shard yesterday. In particular I was wondering how life will be for them following this massive achievement. Having psyched oneself up and trained intensively to do something so public and so dangerous there has to be a moment or two when the question arises, What next? That would be a natural enough thought. There can grow a certain momentum with this kind of massive effort which carries the potential for climbing higher, attempting something more audacious etc. It is the same with less high-profile achievements. In earlier times I can remember the day after having sat a week-long sesshin (meditation retreat). I’d be heavy with exhaustion yet filled with a certain sense of invincibility. It didn’t last thankfully! We were advised that the days following a sesshin were potent times for insights to arise. Thus we were advised to ‘keep sitting’, in spirit at least, and to take appropriate rest of course. See also this post on Field of Merit.